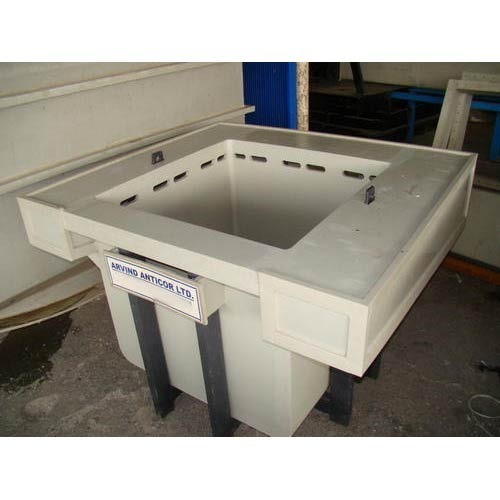 Owing to vast experience and in-depth knowledge of this domain, we are engaged in manufacturing, exporting and supplying Dipping Tank. The offered dipping tank is appreciated for its thermal stability, compact design and optimum storage. The offered dipping tank can be customized in accordance to the specifications provided by the clients. We are manufacturer of dipping tank with new "U" profile and new german technology. Dipping tank manufacture according pollution control norms. All Type of dipping are possible in this tank. Annual Turnover2008-09 Rs. 1-2 Crore Approx. Incepted with a focused approach in 1996, Arvind Anticor Limited is the most trusted Manufacturer, Supplier and Exporter firm dealing in next generation Industrial Tanks and Extraction System. Owing to our close collaboration with leading research institutes we bring forth a wide gamut of industry proven designs of Extraction System, Industrial Storage Tanks and Pickling Tanks for Metal Industries. With a strong dedication to develop innovative technology, we always strive to serve the best to our clientele, and our unwavering enthusiasm to excellence can be seen with the offered benefits of CAD CAM based product designs, radius bended fabrication, superior resistance to corrosion, 100% leak proof, eco friendly fume removal and trouble free maintenance. The well defined objective to anticipate the exacting client needs equips us to strive for product optimization; thereby we are instrumental in rendering customized solutions for chemical processing and pollution control systems across the globe. Further, our competency is improved with the modernized R&D set up that ensures industry proven designs of corrosion free thermo plastic equipments. Besides, our consistent growth is based on the positive feedbacks of our clients from across the country, including renowned entities from Middle East, Asia Pacific, Europe, and Russia.